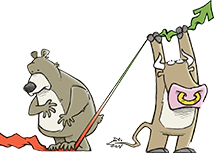 My gut (and math) tell me that ZQK’s decision to accept a pe investment and restructure its debt was probably the right call. The downside is that monetization of other assets is off the table. Now you need to own for the base business, which is a call for a different duration. To say that there were fireworks in Quiksilver’s 2Q is probably an understatement. The direction of operating results was never a major source of discussion over the past few months – it was all about whether the company would sell DC Shoes, and what price would be needed to fix the balance sheet without diluting cash flow. Well… The conversation just changed. ZQK restructured its balance sheet with a $150mm private equity investment, a $200mm term loan, and a European debt restructuring to be finalized in the coming weeks. This likely puts the lid on a DC sale in the near term. It would be highly unlikely that the new private equity partner would have gotten involved with a $150 million term loan (5 years) with detachable warrants representing 20% of shares outstanding (7 year expiration) if the company was going to offload its prized asset. 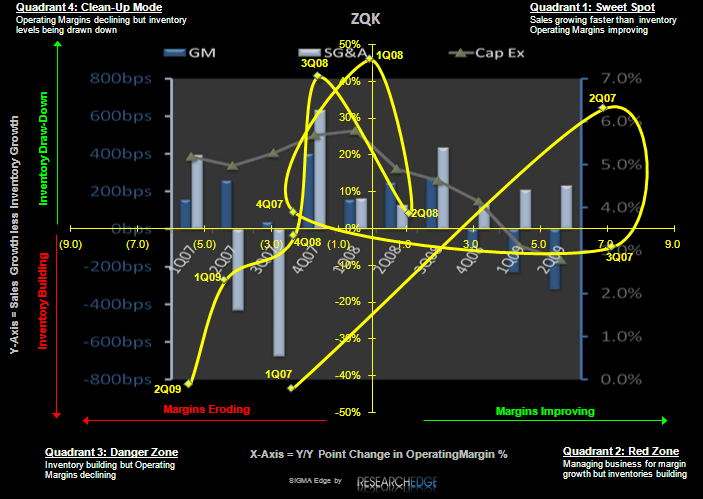 ZQK is now back to a cost reduction and rightsizing exercise that won’t begin to bear fruit until the very least 2010. This might have been the exact move that the company needed to protect its long term brand equity and maximize NPV. But my concern is that most investors buying the stock from $1 up to $3.60 were not as focused on the fundamentals as they were a potential deal. But hey, on a positive note, it took McKnight over 1,000 words of his prepped remarks to get to any remark about Kelley Slater.